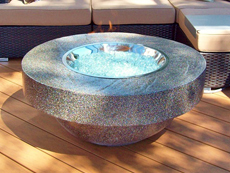 RMHSC’s tumbled-stone finished firepit tables are both elegant and rustic. Hand sculpted, 2-piece, light-weight concrete tables allow anyone to create their own statement piece. Choose your size, shape, and colour. Whether your style is contemporary or modern, complement any conversation area with a west coast inspired table. Use as a cozy area for coffee or cocktails while enjoying the warmth of a fire on a cool night. Blend functionality, durability and aesthetics. 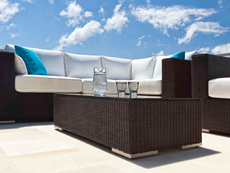 Looking for style and functionality in your outdoor furnishings? We offer you the complete package with our innovative and high-quality patio furniture. Not only is the design and craftsmanship a delight for the eyes, we have also taken care of the environmental and social impact of this exclusive furniture line. Crafted with a 100% recyclable material with zero environmental waste, we offer a unique and sustainable line of furniture that minimizes the ecological footprint. Add to it the fresh and modern appeal and elegant accompaniments, and you just got a masterpiece to add to your home décor. With a versatile look to behold, our innovative line of patio furniture is specially created to suit and elevate your lifestyle. Go through our artistic designs and vast choices that are not only space-conscious, comfortable and convenient but also tasteful and highly elegant.